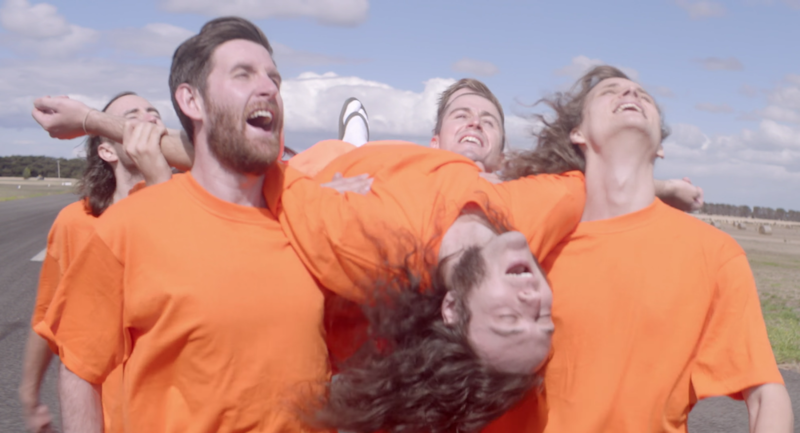 King Gizzard & the Lizard Wizard have opened the floodgates of new music. Since announcing their new album Fishing for Fishies, the Australian psych-rock titans have released a handful of new songs: the title track, “Cyboogie”, “Boogieman Sam”, and now, “Planet B”. New single “Planet B” sees the band channeling their inner John Dwyer. Chugging riffs, manic lyrics, and squealing guitars give the song a heavier feel than the group’s usual psych-rock tendencies, but it still feels at home along the other singles released so far. If each of their songs had a genre, this one would fall under the metal category, for sure. The song’s accompanying music video looks like a prison break on a bad acid trip. The comically large band appears on a desolate highway, each member sporting neon orange clothes and high socks beneath open-toed sandals. They go through a series of workout-like moves (jumping, running, and huddling in a circle) while laughing creepily throughout. Eventually, a guy shows up and shoots them all dead. Watch the music video below. As Stereogum points out, “Planet B” does not appear on the original tracklist for Fishing for Fishies. Is it be a cool song they cut from the album last minute? Is it a track off an upcoming but as-yet-unannounced album? Is it a secret bonus track off Fishing for Fishies that they couldn’t help but release? Only time will tell. King Gizzard & the Lizard Wizard recently announced a North American tour that extends from summer into the fall. Find the full list of tour dates here, and get tickets here.